Embossing – both using embossing folders and heat embossing with embossing powders. This group does quite well on its own! However, when I’m preparing to do a layout challenge and it’s somewhat complicated or difficult to size, I always cut out the pieces from printer paper first. That way I know everything will fit when I use the good papers. I think I like the bold Asian colors, nature themes, and the simplicity of some of the designs. I really don’t look at stamping magazines anymore, but always liked Vamp Stamp News and Just Cards. Yes – Vamp Stamp News, Just Cards, and Scrap and Stamp Arts. Any other hobbies, talents, or craft interests? I like to sew, do machine embroidery, and am an avid reader. Seeing other people’s work, and sometimes a stamp itself will get me going! None. I’m a retired elementary school teacher. Splitcoast Stampers and the former Technique Junkies. No way! We live in a very active senior community, so there’s always plenty to do! I live in Keller, Texas, with my husband and two cats. We are both originally Midwesterners. About a year ago, we moved to a senior community of individual small homes. My husband does the community newsletter every month, and I make cards for residents who are ill, had surgery, or are in need of some kind of support. We are a very social community, and have lots of fun together. 1. Read tutorial on Splitcoast Stampers http://www.splitcoaststampers.com/resources/tutorials/sidestepcard/ to make the base of your card. 2. Cut various sized matting papers to place on the left side and the “steps” as desired. Alternate step pieces so that one doesn’t completely cover another. 3. Choose a lighter colored paper, and stamp Asian characters on it with brown ink, second generation. Cut pieces slightly smaller to go on top of mats. Edge each piece with gold ink. 4. Heat emboss various Asian images on the lighter paper with embossing powder. I used a colored embossing powder. 5. Adhere mats and stamped papers together, and place on base card as desired. 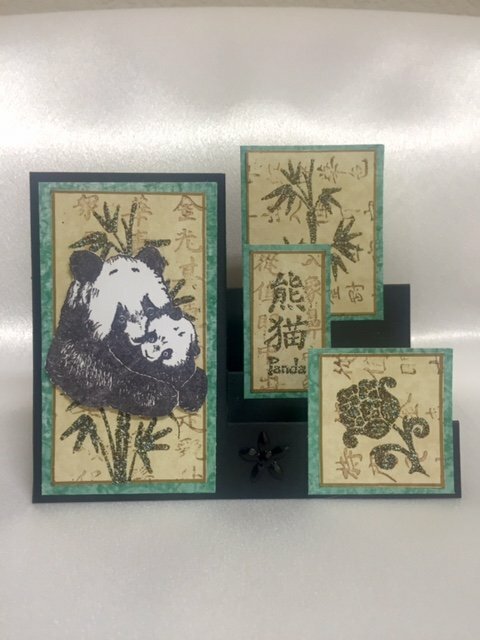 Stamp panda with black ink, cut out, and place on left side with dimensional adhesive. Attach embellishment in middle. Lovely project Barb…enjoyed your bio and learning more about you…a very busy lady! Congratulations…much deserved honor! Congratulations Barb! Your card is beautiful! Beautifully done project Barb! Congrats and well deserved honor for you! Wonderful card Barb!!! Congrats on being Jauary’s SAM…..enjoy your month!!!! Congratulations! Great project Barb. Love the stamps you used. I love your card Barb! Enjoy your Month on being January’s SAM! !